Captain Jim Donovan’s illustrious career as a world-class sport fishing captain began in 1950 when he moved to South Florida and began mating for a charter based out of the historic Bahia Mar Marina. After moving to Florida, he began fishing in Montauk, New York and was the mate for the women’s 50-pound swordfish line class record of 492-pounds 4-ounces — a record that has stood for over 59 years. 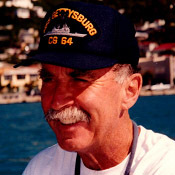 During the course of his career, Donovan captained boats in various locations around the world including top angling destinations such as Cabo Blanco, Montauk, Bimini, Nova Scotia and more. Donovan is best known for being a pioneer of mothership operations which he began in 1978, towing a 43’ Merritt behind a 106’ yacht from the Atlantic coast of Canada to Vancouver, British Columbia on the Pacific coast.